Overton Baker a Black man born free, who was heretofore registered, appeared in the said Court, and satisfied the Court that his register has been destroyed, It is therefore ordered by the court that his register be renewed-and in pursuance thereof, It is certified to all whom it may concern that the said Overton Baker is a man of black complexion, five feet two inches and an half inch high, between forty five and fifty years of age, has a scar on the top of the head occasioned by a burn, and no other apparent mark or scar deemed worthy of notice. And the Court now in session having compared the above register with the said Overton Baker doth certify that it is correctly taken. Virginia-In Louisa County Court Clerks Office April 12.th 1836 Lucy Ann Putney daughter of Mary Putney who was free born this day made application in the said Office to be registered according to law. It is therefore certified to all whom it may concern that the said Lucy Ann Putney is a girl of dark complexion five feet one and three quarter Inches high in the twentieth year of her age, No mark or scar deemed worthy of notice. 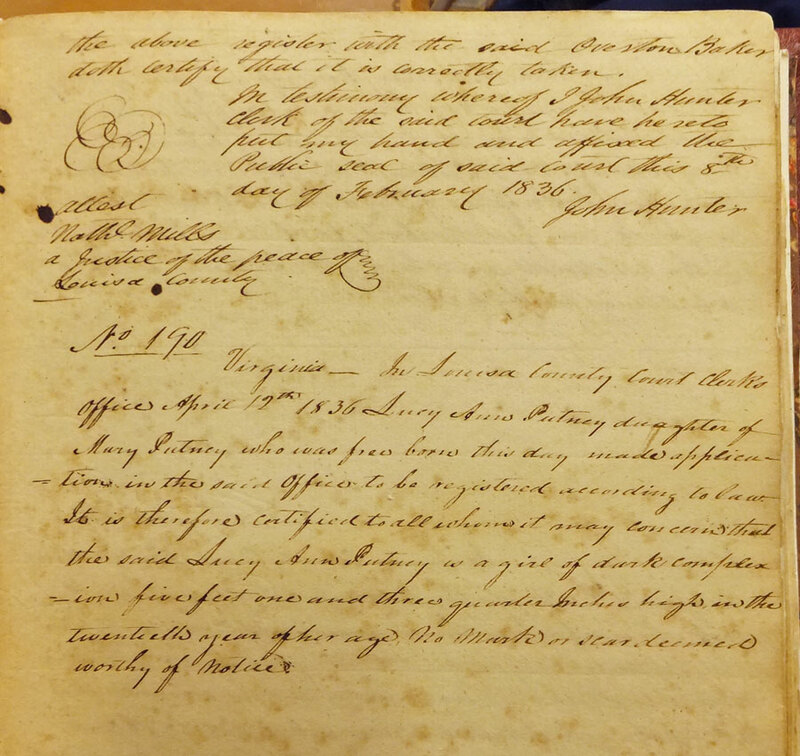 “Louisa County Free Black Register Book 1, No 189B & 190,” Piedmont Virginia Digital History: The Land Between the Rivers , accessed April 25, 2019, http://piedmontvahistory.org/archives14/index.php/items/show/620.